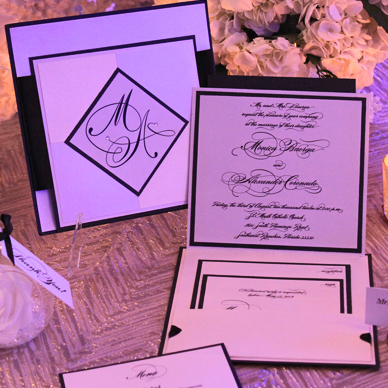 You're here because you just haven't found the right card for your event; why not "Kreate" your own custom invitation/announcement? Fill out the form below to set up a one-on-one meeting or phone consultation with one of our designers. Our "Kreative" team will be more than happy to hear your ideas as well as share some of their own to assist you in designing a custom card that will truly be unique and accentuate your style. No matter how simple or how elegant, our "Kreative" team is always here to make sure all of your needs are fulfilled. Nicole and Lazaro were married on the beach in Mexico over Thanksgiving weekend in November of 2011. 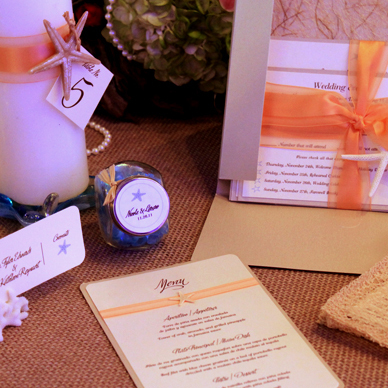 Their colors were Teal and Peach and they chose a Beach Theme. 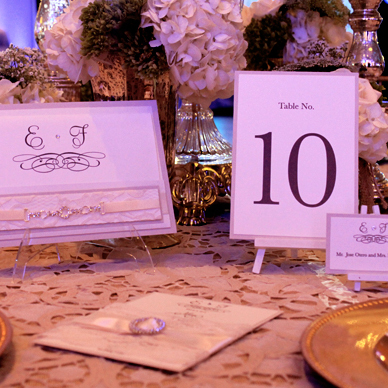 They needed multiple designed and printed pieces and favors that followed their theme. Monica and Alexander were married in August of 2012. Their colors were Black and White and they had a formal affair. 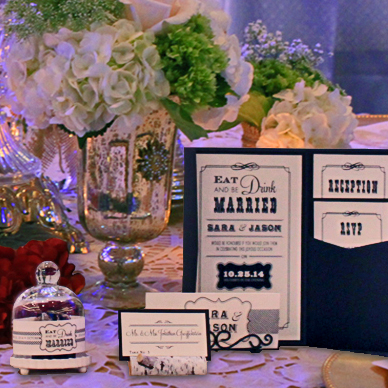 They needed multiple designed and printed pieces and favors that followed their theme. Elizabeth and Felix were married in March of 2013. Their colors were a combination of different shades neutral tans and of whites. They were married at the Miami Beach Botanical Garden. Vanessa and Pedro were married in February of 2011. They went with a shabby chic theme. They choose a hand torn cream heavy card stock. Sara and Jason were married in Key Biscayne, Florida in October of 2014. 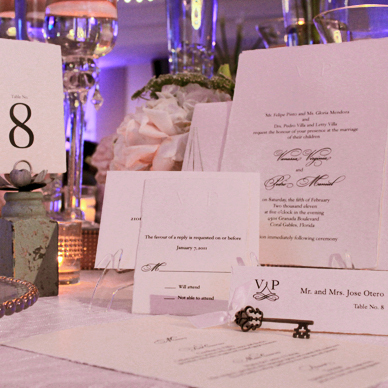 They went with a Vintage Theme for their invitations and reception.